This past Friday, this year’s Episcopal Diocesan Convention took place right here in downtown Richmond. It was a great opportunity to see old friends and colleagues, grow in Christ, and reaffirm our faith and where the Diocese of Virginia is headed in the coming months and years. Here are some of the highlights of this year’s convention. 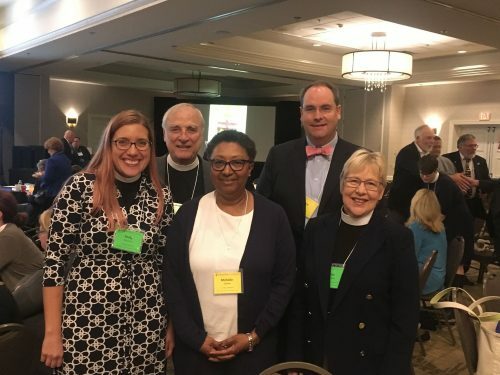 More than 330 lay and clerical delegates from across the Diocese gathered at the Richmond Marriott November 1-3 for the 224th Annual Convention of the Diocese of Virginia. It was the final Convention to be led by the Rt. Rev. Shannon Johnston, Bishop of Virginia, who announced his retirement August 3. At the conclusion of Friday’s proceedings, he passed presiding duties to the Rt. Rev. Susan Goff, Bishop Suffragan. Helen Spence, Chair of the Standing Committee, addressed next steps in the transition process, along with J.P. Causey, Chancellor of the Diocese. Ms. Spence and Mr. Causey also took questions from the floor. The Standing Committee will continue the search for a Bishop Provisional. The Convention passed a resolution that would authorize the Bishop Suffragan, in consultation with the Standing Committee, to hire an Assistant Bishop when and if needed. In his final pastoral address, Bishop Johnston thanked the people of the diocese for “keeping the main thing, the main thing,” during the years when the Diocese was in litigation with breakaway congregations. He celebrated the deepening partnership with the Dioceses of Liverpool, UK, And Kumasi, Ghana – the Triangle of Hope. Bishop Paul Bayes of Liverpool and Archbishop Daniel Sarfo of West Africa were among his special guests at the Convention. • Passing two additional resolutions: one condemning the recent violence against the Tree of Life synagogue in Pittsburgh; the other commending the Way of Love/Rule of Life endorsed by Presiding Bishop Michael Curry. • celebrating the transition of Trinity Church, Charlottesville, from mission status to full parish status. • Approving a budget totaling $4,946,087. The budget featured increased funding for college chaplaincies, a new ministry for the hearing impaired, and continued support growing ministries across the Diocese. More convention coverage will be added to the diocesan website, www.thediocese.net, in the next several days.